Battleview Market restaurant and deli serves the southern Washington County region. 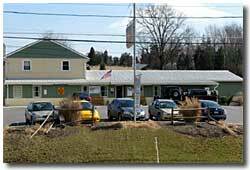 Located in the heart of historic Antietam Battlefield in Sharpsburg, MD. Battleview Market is a premiere convenience store offering a wide variety of services. Plenty of free parking. Buses are welcome. Battleview Market serves breakfast, lunch, and dinner and welcomes call in orders. Dine in or carry out, we're open 7 days a week. Copyright © 2003 All Rights Reserved by Battleview Market.